Finding a particular face in a crowd is something human minds have difficulty doing in settings much larger than a café. We are able to use context clues in such a setting, like a friend waving their arm or a table with just one person sitting at it. But in something more akin to a major league sports event with 40 thousand people such a task is impossible. Technology which can “fast-track” through massive amounts of data (hours of surveillance video with changing lighting and moving crowds) is now increasingly in demand. Facial recognition allows alerts to be sent out when a specific individual(s) enters a location and helps in post-event investigations as it can identify and track the movements of an individual. As we have investigated previously, Deep Learning algorithms are the go to solution for these types of tasks. These are the same algorithms used in everything from predictive advertising, crime prediction, and chess/game playing software. Yet facial recognition is uniquely complex and comes with its own host of challenges. Pouring through vast amounts of data or trying to connect old images to the current appearance of an individual is just the beginning, but can still paralyze standard surveillance systems unable to make sense of the information. System hardware is simply too slowed down with the sheer volume of data necessary to perform the tasks needed. Furthermore, traditional “intelligent video” needs a consistent and stable background. It is for these reasons and more that this new, smarter breed of facial recognition is the future of video surveillance. Something we have not looked at before in our “Security News” section are the two key steps of facial recognition algorithms; “Feature Extraction” and “Classification Learning”, defined briefly below. Classification Learning makes use of so-called “shallow” learning and analysis; the kind used in old intelligent video solutions. Feature Extraction sets the new technology apart from the old. This is where human design of features allow the system to perform adequately in specific environments even with subtle changes in background and lighting. However, this brings about some degree of sacrifice in accuracy. Employing Deep Learning in these tasks improves the accuracy of facial recognition to a significant degree. This is due to a greatly more sophisticated and modern algorithmic structure that more closely resembles human learning. The layers of such a program can reach above 100, permitting data processing in huge amounts and of increased complexity. 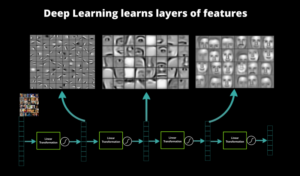 Like the human learning around which it was designed, Deep Learning uses “layer by layer” feature-extraction processes. With each layer comes a different “weight”, which directly impacts what the program will learn about the components of visual data. Because Deep Learning works alone and without human intervention, it can extract as many of these features as possible, even if they are abstract or even impossible to describe. Features like this are why the programmers of these systems often cannot explains how their software was able to learn something new. The code is simply too abstract. With more features comes greater accuracy. Through these means, facial recognition above human levels can be achieved, and in a tiny fraction of the time. High level facial recognition of this caliber improves both security and investigation and has applications extending into many different industries. Banks, shops, hotels, and even bars and nightclubs all stand to benefit. Finding a face in a crowd of people almost instantly will only increase in demand in the near future. Even as Summer closes, neighborhood and apartment swimming pools and related facilities face break-ins and the associated liabilities such as trespassing, vandalism and etc. Perhaps even more risky is the fact that in the case especially of children and teenagers who decide to sneak past your perimeter can cause a legal suit for you to deal with should they injure themselves. When you are securing a pool, Videofied often makes the most sense because of the portability, weather hardiness, and the ability to do things like sound or not sound alarms, depending upon whether you want to just scare off the intruders, or silently have police come to catch them in the act. While this is certainly not the only way to secure a pool environment, it does offer in-suite access control ability through the use of key-fobs, quality video, and the quickest response times in the industry while reducing or eliminating the false alarm rate.